2. Peel the squash and cut lengthwise. 3. Scoop out the seeds and stringy stuff. Put in a bowl and save for later. 4. Cut the squash into strips and then into cubes. Place on baking sheet. 5. Pour oil on squash and toss to cover. You can also use a pastry brush to get all the edges covered in oil. 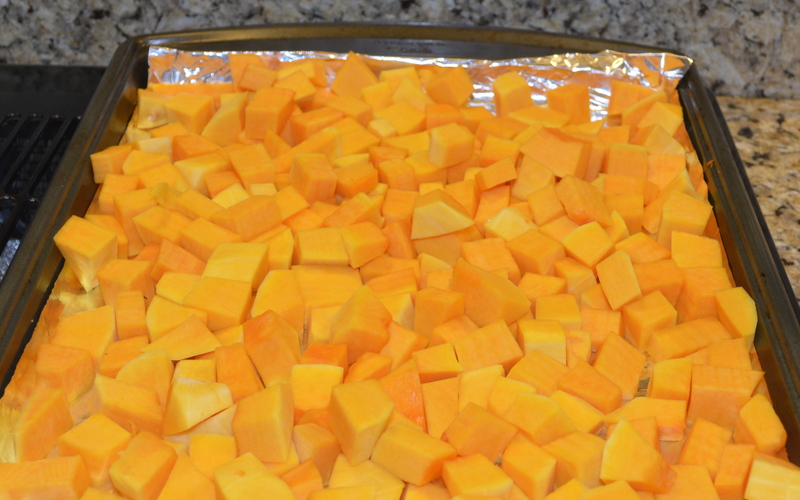 The oil will help prevent the squash from sticking to the baking sheet. 6. Sprinkle the salt on the squash. 7. Bake for 45-50 minutes. Or as my yiayia would always say, “Cook it until it’s done.” I usually cook it for about 45 minutes and then check it every 5-7 minutes until I see perfectly toasted squash, like in the picture below. Don’t throw them away! The seeds have many nutrients and taste delicious when toasted. Add it to a salad or enjoy them on their own for a nutritious snack. 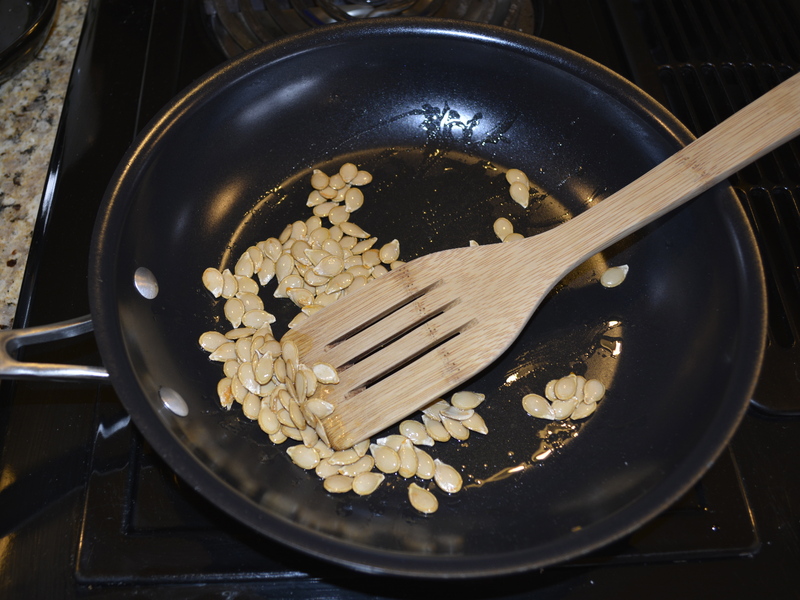 I cook mine in a pan, but you can also roast them in the oven, just like you would pumpkin seeds. 1. Separate the seeds from the stringy stuff. 2. Put the seeds in a bowl of water. 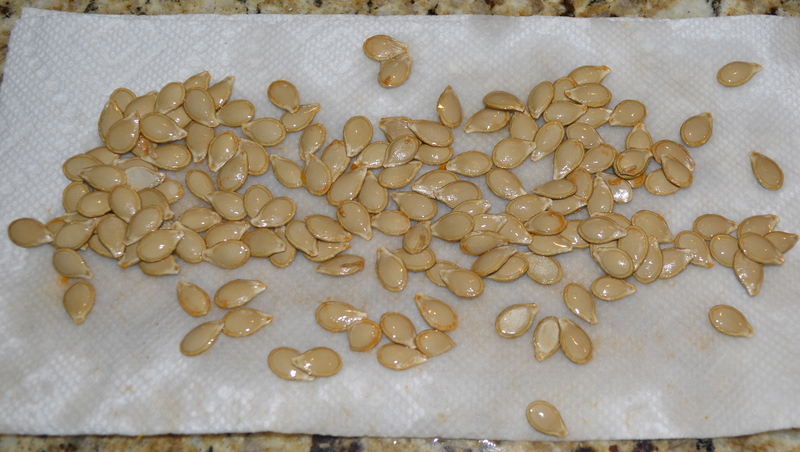 Agitate the seeds to get all the squash residue off of the seeds. Drain. 3. Put down a folded paper towel. Place the seeds on the towel. 4. Fold over the edge of the paper towel & pat dry. 5. Put the seeds, oil & salt in a pan. 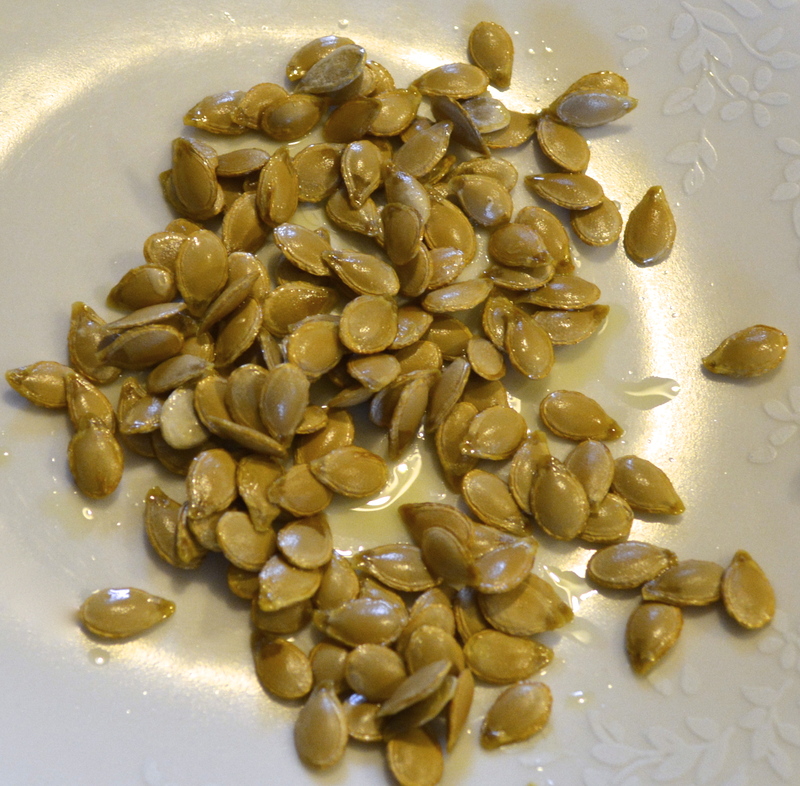 Toast the seeds on medium-low heat. Once they start getting toasty, they can burn very easily so make sure you constantly stir the seeds. 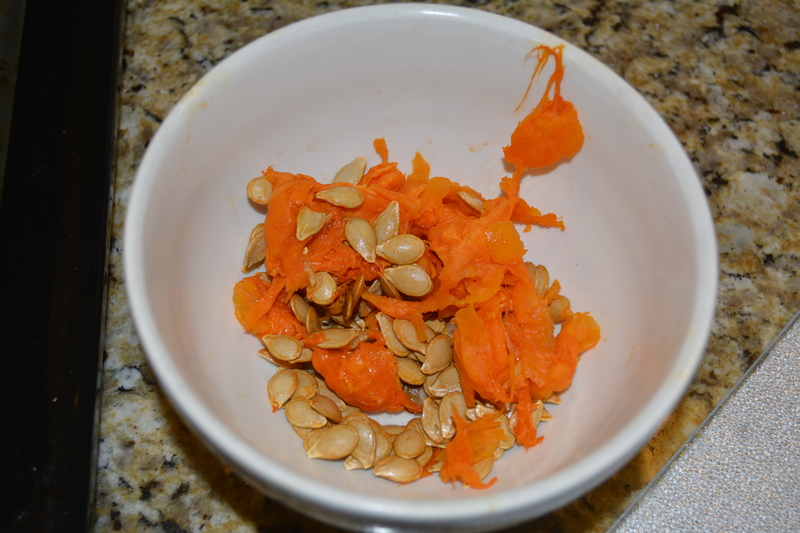 Also, make sure you do not heat the pan too high, as the seeds will pop. It probably takes about 15 mins. 6. 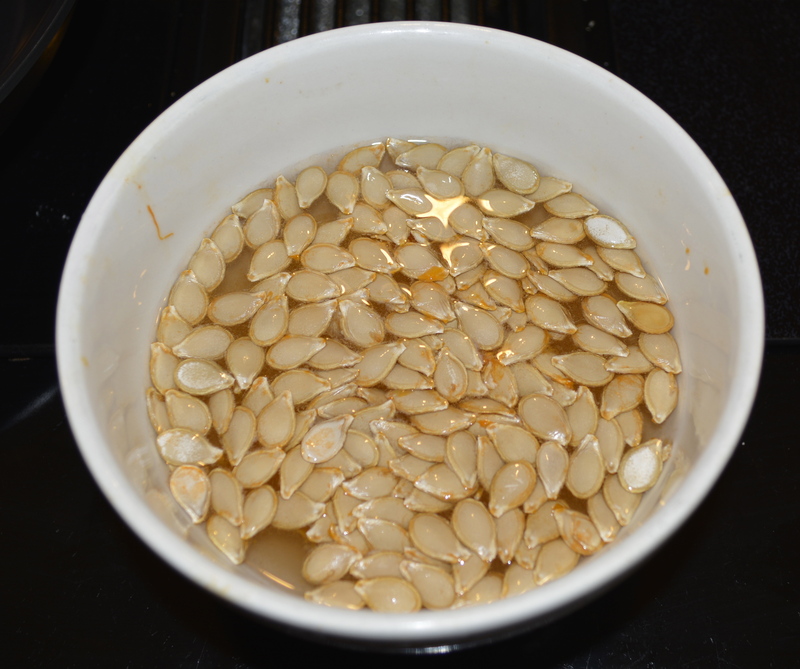 Immediately after removing from the heat, put the seeds on a plate to cool. They will continue to cook if left on the pan. 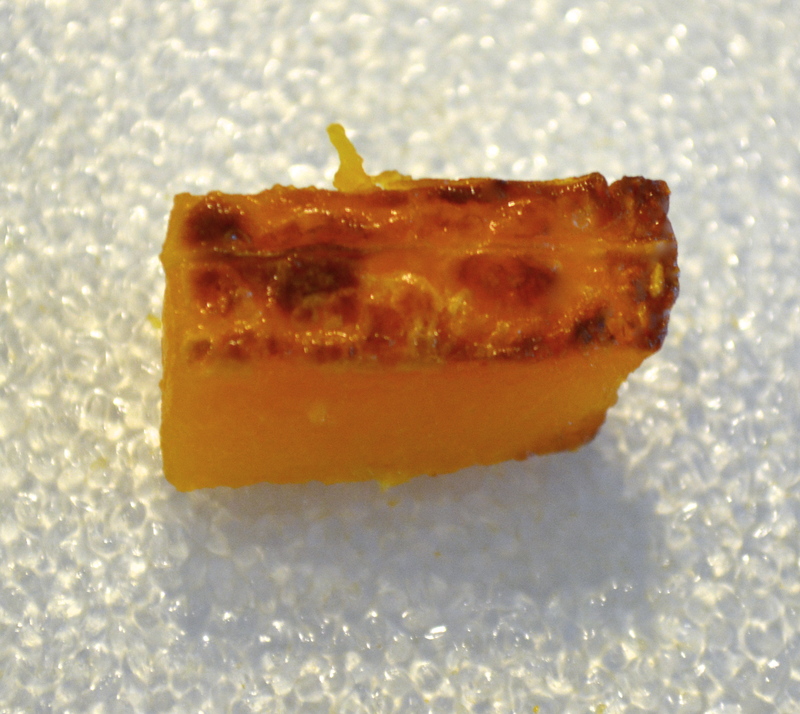 Have left over roasted squash or your kids refuse to eat it? Try turning it into Squashy “Pudding!” It’s gluten-free & vegan and so yummy! Check back tomorrow for the recipe. Posted in Allergy-Friendly Fasting Recipes and tagged butternut squash, roasted vegetables, seeds on March 31, 2014 by Kristina.